We spend lots of time and energy creating the best possible lessons that we can. We get excited about them and feel good about them. Thus many days, armed with well thought-out lessons, we achieve a measure of success in our classes. But then there are those days when nothing works. When the lesson we poured our energy into falls flat on the floor. The kind of day when the lesson is getting disrupted by off-task students, and a carefully scaffolded intro leaves student after student saying “I don’t get it”, “what am I supposed to do?”. The volume of off-task chatter rises and opens the door to increased behavior problems. 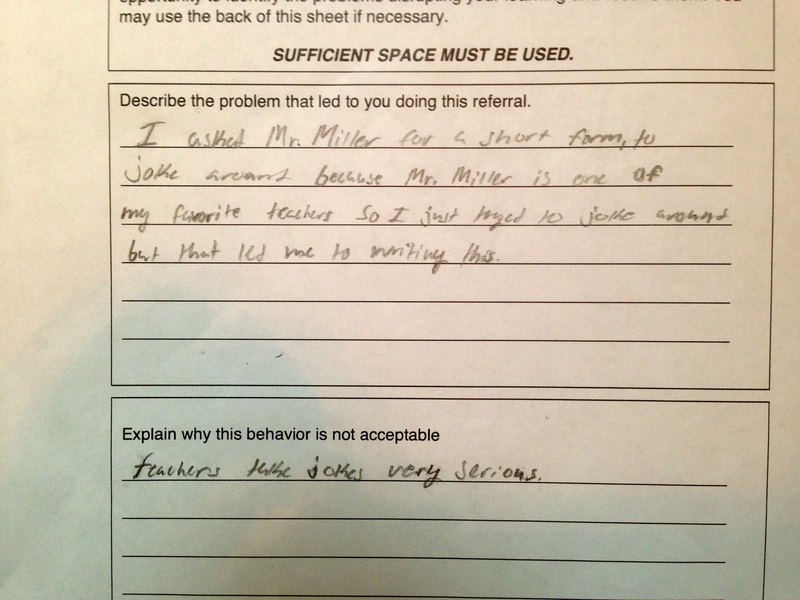 Behavior problems by the way, that are ripe for misintrepretation by the now frustrated teacher. First thing to remember during these times – You are not your lesson plan. Thus every student act of ignoring it, failing at it, brushing it aside, sleeping during it, distracting it, or any other negative, is not a personal affront to you. That took me awhile to realize. In my own practice, in the midst of my favorite lessons failing it would bring up anger and frustration, often towards the students who were most clearly rejecting me (of course they were not actually rejecting me, but hence the point of this post). There are an array of reasons a lesson might fail, but you will be unable to properly diagnose any of them if you are angry. Anything in your teaching practice that creates negative energy towards your students, your profession, or yourself, needs to be analyzed and reconstructed. These negative emotions commonly end up concluding that the lesson failed because the students are lazy, don’t care or don’t pay attention. Maybe they were or didn’t, but if that is the primary conclusion then you are overlooking a couple important facts: First – there is a way to improve the lesson and those students are helping you discover it. Secondly, deep down you were probably personally offended by the way the students interacted with your lesson, which is intimately connected to your identity as a teacher. Thus you feel like a failure, and angry at those who exposed you. Experience doesn’t necessarily help in this situation. This problem of identifying with our lesson plans actually got worse for me as I became more experienced. 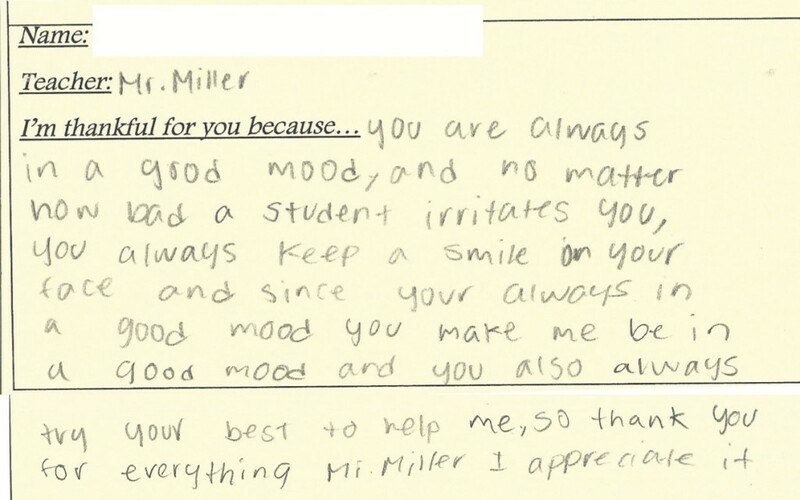 Because often at some point we as teachers, who pour ourselves into teaching, begin to recieve a fair amount of praise from adminstrators and students. We start to look at ourselves as great teachers, which makes the day when that identity is challenged even more difficult to take. So bottom line is this: You aren’t your lesson plan. Don’t take it personal. If you have a lesson that collapses into failure don’t get upset, don’t get stressed out, don’t get frustrated. Stay positve and do whatever you have to do in that moment to teach the best you can. Afterwards, I recommend you take a moment to reflect on what went right, what went wrong, and how it could be improved. Make sure you properly file that reflection so you can use it the next time you plan the lesson. After that, just finish the day and be done with it. “Nonetheless, I’m done here. There are one or two more fragmentary physical-type remarks I’d like to make, but I feel too strongly that my time is up. Also, it’s twenty to seven, and I have a nine-o’clock class. There’s just enough time for a half-hour nap, a shave, and maybe a cool, refreshing blood bath. I have an impulse-more of an old urban reflex than an impulse, thank God- to say something mildly caustic about the twenty-four young ladies, just back from big weekends at Cambridge or Hanover or New Haven, who will be waiting for me in Room 307, but I can’t finish writing a description of Seymour-even a bad description, even one where my ego, my perpetual lust to share top billing with him, is all over the place-without being conscious of the good, the real. This is too grand to be said (so I’m just the man to say it), but I can’t be my brother’s brother for nothing, and I know-not always, but I know-there is no single thing I do that is more important than going into that awful Room 307. There isn’t one girl in there, including the Terrible Miss Zabel, who is not as much my sister as Boo Boo or Franny. They may shine with the misinformation of the ages, but they shine. This thought manages to stun me: There’s no place I’d really rather go right now than into Room 307. Seymour once said that all we do our whole lives is go from one little piece of Holy Ground to the next. Is he never wrong? I’m filing this post under classroom management because our own personal happiness as teachers is often the most important ingredient to a positive and productive classroom.